Concrete Protection | (86)10-69687750 | MUHU (China) Co., Ltd.
1 Concrete Protection – M400 water-based elastomeric coating M400 is the latest technology to subject to resistant the severe weather condition, chemical eroding, etc. 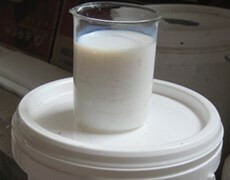 It is a white emulsion with single component system. It is a highly elastic tough waterproofing system, co-polymers and a carrier solvent. It is highly resistant to aggressive soils and soluble salts providing an effective continuous barrier and protection against waterborne damage. This is ideally suited as a vapour/salt barrier to building facades behind granite, marble, stone cladding, and curtain wall elements.M400 with the requirements of the following standards: ASTM D 412. 2 Concrete Protection – Concrete Interface Treatment Agents MNC-302 concrete interface treatment agent, a kind of cement mortar adhesion intensifier, is of a two-component emulsion using the water-emulsion epoxy resin as its basic material, with outstanding adhesive ability with substrate materials such as smooth concrete, veneering bricks and slabs, metals, lumbers and plastics. It has excellent water resistance, moisture and heat resistance, anti-freezing/thawing and aging performances. MNC-303 is an one-component interface treatment agent for concrete. It aims at improving cement mortar adhesiveness to the concrete substrate to avoid hollowness and peeling in the plastering layer. 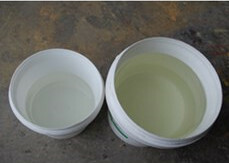 MNC-303 can substitute alkali degreasing and roughness treatment to the concrete substrate. 3 Concrete Protection – Water Based Concrete Curing Compound MNC-Y is water-based low viscosity emulsion curing compound for concrete containing an alkali reactive emulsion breaking system. The system forms a continuous non-penetrating film on cementitious surfaces preventing excessive water evaporation leading to more efficient cement hydration thereby reducing shrinkage and increasing durability. 4 Concrete Protection – Reinforced Steel Bar Corrosion Inhibitor MNC-RI is a DGI type (Darex Corrosion Inhibitor). It can be mixed with cementitious materials to contribute to new construction or repairing project. MNC-CI is a MCI type (Migrating Corrosion Inhibitor). It’s normally brushed on the concrete surface to permeate inside and get around steel bars. It’s mainly used in repairing project. 5 Concrete Protection – Finishing Agent It’s finishing paint that’s used after top coating. It has tenacious adhesiveness, retains color and brightness. After drying, the membrane doesn’t absorb dust while improves self-cleaning ability, waterproofing, alkali resistance and superb anti-weathering ability of coating. It effectively protects coating from rain, frost, efflorescence and corrosion, greatly extending life expectancy of coating. 6 Concrete Protection – Elastic Latex Paint For Interior and Exterior Wall Confected with high elasticity Cross-linking acrylic latex, titanium white powder, filler and additive, it has excellent performance as the normal high-level latex paint for exterior wall, such as outstanding weather ability, color retention water and alkali resistance, in addition with high elasticity, it can cover exiguous crannies occurring by the deformation of the substrate or deformation caused by the temperature. This keeps excellent decoration function of the coat more.